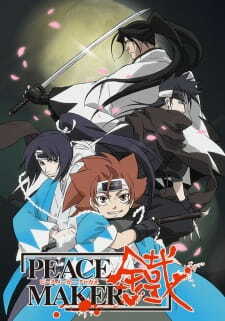 Peace Maker Kurogane is a historical action series based around the Shinsengumi; the Japanese police force active in the Edo period, perhaps now popularised in the West by the success of Gintama. Like many of its anime counterparts, the series is only loosely based on actual events, with much of the material taking an episodic, comedic route. We follow Tetsunosuke, a young boy set on joining the Shinsengumi in an attempt to seek revenge on the man who killed his parents two years earlier. As far as revenge plots go; it's fairly typical, standard fare. As events heat up, however, the story begins to fall in line with history, with much of the action and drama centered around the Ikedaya incident. This affair was a clash between the Shinsengumi and a band of politically agitated ronin, which occurred in July, 1864. The story presents a splendid blend of historical and original material, with some events united more seamlessly than others. In-between the dotted story episodes are a variety of episodic ventures, which contain many of the series' most comedic moments, or at least aspire to. There's a little toilet humour and a couple of cheap punchlines, but for the most part, the comedic beats hit home. The story comes across as an entirely comprehensive piece, despite lapses in development, and while the premise comes across as cliche and overdone, the payoff is a satisfying and compelling watch. The animation and art style complement each other well and the cinematography, while not overly complex, doesn't miss the mark. The action sequences are well choreographed, exquisitely animated and a wholly enjoyable experience. Gonzo do a fine job - watching Peace Maker, it dawned on me how much of a shame it was the studio now have such little presence. The music is, for the most part, fairly forgettable. It doesn't come across as out of place or wrong - in fact it suits the setting well, with a variety of different tracks to emphasize certain moods or actions - but it never really pushes the boundaries of what can be accomplished. With its roots in the historical Shinsengumi, the characters in Peace Maker -- for the most part -- are based on real people, albeit heavily edited in appearance and personality. Due to the inclusion of many comedic elements, the characters exert what I imagine are incredibly different characteristics to their historical counterparts. Nevertheless, the characters come across as an interesting bunch and are fun to watch. The character development isn't the most notable aspect of the series, however, and the characters lack a certain well-roundedness and portray only a select few attributes; the villain especially is rather one-dimensional. Appropriately, the leading character Tetsunosuke grows the most, and his journey at least has a sense of progress. Despite shortcomings, though, the cast are a rich, varied and exciting element that add a certain flair to the series. Overall, Peace Maker is a thoroughly enjoyable watch. A fine blend of action and comedy not so unlike its could-be cousin, Gintama. Certain changes prevent it from being an entirely historically accurate show, but the original material is well written and well presented. Though perhaps not as memorable as it could have been, with a harmonious blend of comedy and action, it's a series entirely worth watching. Right now, I think my opinion is a little colored by how surprised I was by this anime. As I chain-watched episodes of this show, I kept on thinking things like: &quot;Wow, I am actually really enjoying this&quot;; &quot;Why didn't I hear about this before?&quot;; and &quot;This is really good&quot; in this surprised tone. I mean... I had never heard a peep about it before and I was just checking out a character picture to see decide if the guy was hot or not. But it ended up being really good. Funny, huh? Story: I'd categorize it as a historical drama that uses action as backdrop, meaning that the plot and the characters are firmly in the forefront. There's definitely action (and it's exciting and occasionally graphic) but it isn't the central focus; it just helps fill in the finer details... it isn't action just for the sake of having action, you know what I mean? When I first started watching and I saw Tetsu trying to join the Shinsengumi, I thought it was going to be like History's Strongest Disciple Kenichi -- a lot of training, a few fights, some comedy beats... and what I got instead was a compelling drama about identity and coping with your demons, along the lines of Rurouni Kenshin: Tsuiokuhen (but younger, louder and generally more light-hearted). Set in the same time period as Rurouni, the era itself already is soaked in questions of identity and tradition vs. progress. It was surprisingly mature and well developed in both the depth of the characters and the breadth of the issues they tackled: the burdens of violence, the cost of peace, what shape do the scars of our pasts really take? And though I was personally rooting for one side, I don't think either side was actually labeled good or evil. I appreciated that the show seemed to be acknowledging that there isn't always a right or wrong -- sometimes there's just a conflict. There's also a nice serving of funny moments and conversations scattered throughout the storyline that are well used by the author. They either let you get to know the characters better or help make them more cute and loveable. Sometimes they break the tension so you can finally exhale. And most importantly, there was a weight to the story, which I attribute to good craftsmanship, that sucked me in. Things that mattered to them mattered to me too and I really wanted things to work out and go their way and... I just felt really invested in their story and I don't think that happens without really good storytelling. The only nitpicky thing I could complain about, story-wise, might be the way that some of the storylines resolved. But I don't really want to go into detail because it might give things away... so, I'll leave it at that. Animation: Generally, I liked it. I wouldn't say it was outstanding. Or even above average. But it good. And it suited the story and the characters, I think. It's actually a pretty decent collection of good looking guys... too bad about the mullets. ...Did they actually wear mullets or was this just some very peculiar style choice by the mangaka? Some the action sequences were well done, I thought. No where near the caliber of the action in Rurouni Kenshin: Tsuiokuhen, but as good as or better than the usual anime fare, I think. P.S. The only thing about the voice acting I have to say is that it was fine minus two guys who were doing their impressions of Hisoka from Hunter x Hunter. I kept on checking to see if it was the same guy on MAL (it isn't) and it was driving me nuts just because they weren't as good at it as Hisoka's actor, Hiroki Takahashi. Well this is my first review and everything might had been said but I think I'll try my best. Story: It's one of the two best anime I've seen on the beggining of the Meiji area in Japan around 1865. In &quot;Rurouni Kenshin: Tsuiokuhen&quot;, the side of the Ishin Patriots is presented, but in Peace Maker, it's the side of the Shogun clans. Everything happens in a small periode of time from the encounter wiht the Shinsengumi to the end. Art: Well, if you don't like blood, violence, injuries, or ... you won't like it so much, but it's well done. It's more colorfull than some violence anime, but the drawings keep the serious atmosphere when it's needed. The long serie of Rur. Kenshin didn't make such a good job. Sound: Well, There isn't anything special, but it supports well the transitions between action and comedy. Characters: For a 24 episodes anime, a lot of characters are presented and most of them are developped. They have their own personalities, but nothing too flashy or new. I liked the similarities between the two leaders. They look alike and it revels how much each side is acting the same way to achive two different goals. Enjoyment/Overall: Well, a very good anime with a lot of actions and progression. (typical of shoumen) Very well done, fun and interesting to watch. Less comedy than in Kenshin (long serie) but still fun by parts. Well to say the truth, this anime cost me a mathematics exam! Let me say right now if you are fan of the Shinsengumi or any type of samurai anime then Peacemaker Kurogane is a series you must check out. Story: the story is about a young boy named Tetsunosuke Ichimura who wants to join a group of samurai working for the shogun known as the Shinsengumi to avenge the death of his parents who were killed by a member of the shinsengumi's enemies known as the Choshu clan. But because of his short stature, bratty personality, and lack of experience he is assigned to be the personal servant of the groups vice commander Hijikata Toshizou. But after witnessing the groups top swords man Okita Souji murder a choshu clansmen who tried to kill him, Tetsu realizes that wanting avenge his parents isn't as easy as he thought it would be and now must learn in order to become a true swordsman you must throw away your emotions and become a demon. Characters: most of the characters in this series are based off actual historical members of the group but are all portrayed with their own unique personalities which makes each one enjoyable to watch. art and animation: the artwork and animation are all top notch and i think the fight scenes are the strong point in this series because their fast paced but at the same time somewhat realistic. Sound: the soundtrack in this anime is very enjoyable and the background music fits very well with certain scenes in this series.